When Shigeru Miyamoto was inspired to create The Legend of Zelda he drew from the deep well of his experiences growing up in rural Kyoto. As a young boy he would hike around the countryside exploring fields, woods, secluded lakes, caves, and villages, revelling in the wonder, excitement and sense of adventure he felt while doing so. Miyamoto wanted to convey these feelings to a wider audience in game form by creating a “miniature garden” gamers could keep inside their drawer. That garden became the Zelda series’ Kingdom of Hyrule, a patchwork quilt of Miyamoto’s childhood enjoyed by millions of gamers both young and old for decades. Makes you feel all gooey inside doesn’t it? Sadly not everyone’s childhood is quite so idyllic. If Miyamoto’s had been a living hell of abuse at the hands of an overweight psychotic mother with a damp gussett for God, then assuming he hadn’t spent the rest of his life in therapy he might have made something like The Binding of Isaac (TBoI). Instead we’ve got Edmund McMillen, of Super Meat Boy creators Team Meat, and two twisted collaborators to thank for this dark homage to Zelda, Robotron and roguelike RPGs for PC and Mac. Drawing its inspirations from McMullan’s morbid fascination with the “Satanic Panic” of the 1980s, documentaries about religious abuse of children, and Christian propaganda movies that claimed Dungeons & Dragons and rock music led kids into the grubby mitts of Lucifer, TBoI is as far from sunny Hyrule as you can get. Deep underground in a damp filthy basement, crying to itself. Make your own personal Jesus! TBoI casts you in the titular role of Isaac, a happy little boy who spends his days drawing with his crayons and playing with toys until his mother has a schizophrenic episode while watching evangelical Christian TV shows. Commanded by the voice of God in her head, Isaac’s mother strips him of his toys and other “sinful” things and locks him away in his room to isolate him from the evils of the world. If things weren’t wretched enough for the poor little sod, the voice of God eventually commands Isaac’s mother to sacrifice him to prove her faith and devotion. Before she can do him in with a kitchen knife however Isaac finds a trapdoor hidden under a rug in his room and escapes into the cellars beneath the house, where things just get worse. A horde of Isaac’s deformed siblings and other critters are lurking in the depths waiting to get him, and all he has to defend himself are his tears. TBoI’s gameplay is a hybrid of Zelda-esque dungeon delving and the dual-stick shooting of Smash TV and Robotron. 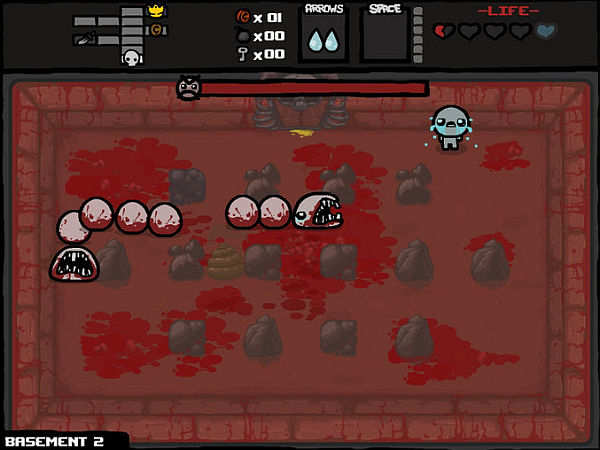 The WASD keys control Isaac’s movement and the arrow keys fire a stream of tears in one of four directions. You can also angle your shots with some deft key-presses and a bit of lateral momentum, but it takes a bit of practise and isn’t something you can rely on all the time. TBoI has no native support for controllers so unless you use a third party application like Joy2Key you’re stuck using a keyboard or a combination of keyboard and mouse, which still only lets you fire in the four cardinal directions. I often found myself wishing I could fire in a 360 degree arc, usually while being chased by a swarm of enemies closing in from all directions. In hindsight this would have neutered many of the game’s challenges and diminished the satisfaction of overcoming them. 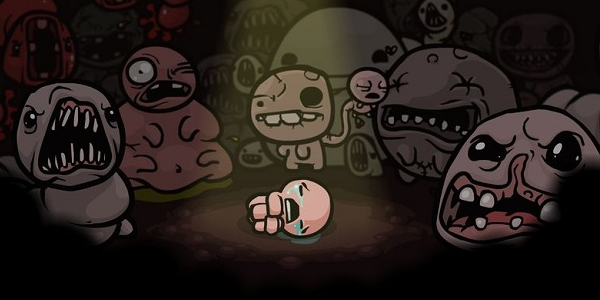 The weight of the odds stacked against you makes every victory in TBoI a tiny spark of hope and triumph in Isaac’s dark and miserable existence. As with Zelda, Isaac can also deploy a limited supply of bombs to blow open doors and secret passages, remove barriers or destroy groups of enemies. 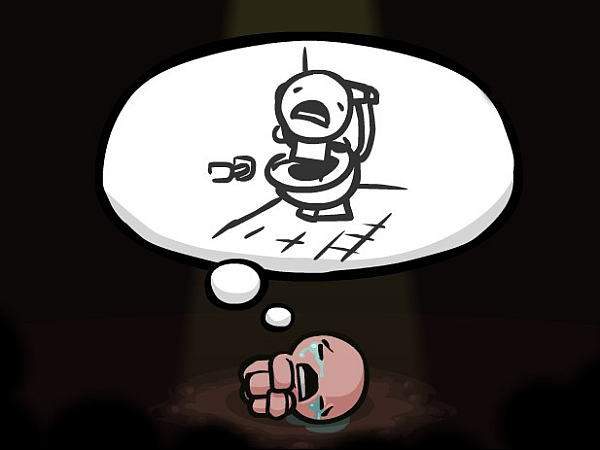 On each level there’s always at least one special item from a whole weird and wonderful selection that boost Isaac’s speed, attack power and health, or grant him unique special abilities. These items can also drastically change Isaac’s appearance in bizarre ways, and each new trip into Isaac’s nightmarish world can result in a wildly different wardrobe from the last one based on what you find. At the end of my last playthrough Isaac had become a plague-ridden flying head wearing a surgeon’s mask and a crown of thorns, accompanied by a floating bag of money and the ghost of a little dead girl. This lunatic meta-game of childhood dress-up compels you to keep replaying just to see what kind of cross-dressing Frankenstein’s monster you end up with next. Even the unlockable characters, which differ from each other in their basic stats and starting items, are just Isaac dressed-up in a fez, an eyepatch or a blonde wig. I feel your pain Isaac. We’ve all been there. Speaking of appearances, Edmund McMillen’s signature “Cute Grotesque” art style from Super Meat Boy is in full swing here and he renders even the most terrifying demon baby with bleeding eyes adorable in its own twisted way. As someone who grew up with the Garbage Pail Kids and Ren & Stimpy, and a fan of comics by Johnen Vasquez and Roman Dirge, I couldn’t help but grow to love TBoI’s ensemble freakshow of oddly-charming walking abortions. It won’t be to everyone’s tastes however – particularly since the game is essentially all about child abuse – and even I was a bit startled by how utterly grim one of the ten multiple endings was. On the audio side of things, Canabalt and Super Meat Boy composer Danny Baranowsky has crafted a great soundtrack that captures the mood of the game marvellously, encompassing the creepy, the melancholic and the epic in equal measure and to great effect. Random dungeon generation is the key mechanic TBoI takes from roguelike games, right down to the placement of monsters, loot and obstacles in individual rooms. This procedural generation ensures each dungeon level is unique and that every new room you enter is a surprise, creating a rollercoaster of challenge and reward that leans heavily towards old school Nintendo-hard. An unlucky throw of the procedural dice can have you frantically weaving through a maze of pits, spikes and boulders to avoid an enemy you’d normally mop the floor with. End-of-level bosses are also selected at random and they vary in difficulty from pathetically easy, like the Duke of Flies, to tricky buggers like Loki the annoying little red imp with a gazillion different bloody attacks. Additional challenge comes from simply making it through to them with enough health to cover any cockups you make during the fight, which is easier said than done on later levels where regular enemies are meaner and mini-bosses appear more often. 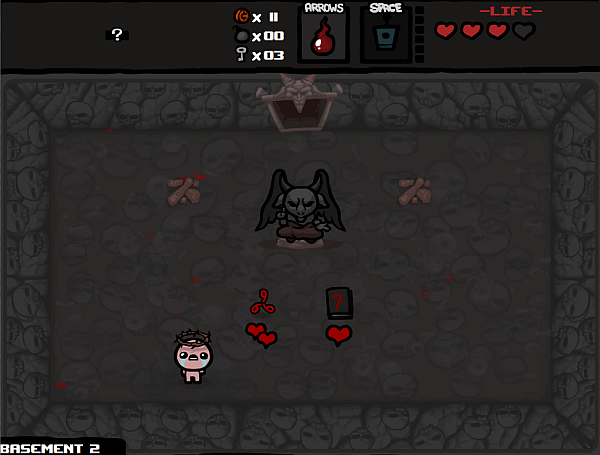 Another roguelike feature TBoI borrows is that you only have one life unless you were lucky enough to find one of two items I know of that give you more, one of which permanently lowers your health to one heart. Unfair? Perhaps, but then life isn’t fair is it? If this game has a philosophy, conscious or otherwise, that message festers at the very core of it. TBoI doesn’t care whether you only made it as far as the second room on the first dungeon or got annihilated by the final boss, whether you have 27 bombs and 99 keys or barely two pennies to rub together. Once that little row of hearts runs out you have to start right back from the beginning with none of the cool stuff you picked up. TBoI is intentionally geared towards repeated play and while it can indeed be very discouraging to lose a bunch of awesome power-ups from one little mistake, successive playthroughs reward you by unlocking more items and monsters to discover. After 18 hours of play I’m still finding new stuff and different item combinations to mess around with. Yes, that is a turd you see there. During my many playthroughs I encountered only two bugs. Both annoyingly happened during really good runs, and both forced me to quit to the main menu and restart from the beginning. One was when a powerful boss attack knocked Isaac off-screen through a wall, and the other was when I got trapped on a ladder over a pit between two animated statues as they were spawning. The first has since been fixed in a patch and the second was one the kind of crazy fluke unlikely to effect more than a handful of players. Some people on the Steam forums and elsewhere have reported performance issues stemming from TBoI being programmed in Flash, as well as a rather nasty bug that arbitrarily wipes all of your save data if you clear your browser cache. I had no performance problems whatsoever and the rage-inducing save deletion bug has thus far spared me. Everyone’s machine is different however and whatever works for me may not work as well for you. McMillen swiftly released a patch to fix most of the more serious bugs, so we can likely expect fixes for the others pretty soon. Unless you have a pathological aversion to paying a single penny for a game made in Flash, are ridiculously sensitive to toilet humour and depictions of religion, or only play games that constantly hold your hand and tell you you’re a precious little snowflake, you’d be an absolute bloody fool to pass on this game. If you enjoy a challenge, aren’t easily offended or grossed out, and are looking for a fun and freakish dungeon romp that’ll keep you coming back for weeks on end then The Binding of Isaac is more than worth its modest price. It’s one of the best under-£5?s I’ve ever spent, and that includes the time I bought nearly a fiver’s worth of discount Pic-N-Mix on the way home from Bluewater shopping centre. If you like a retro-styled challenge and don’t mind the cute grotesque art, scatological humour and dark themes, The Binding of Isaac will give you more hours of enjoyment than the majority of games ten-times its price.